*The Down Puff requires regular replacement. 1x Safety Razor Blade, yields 6 mini blades. This Ear Cleaning Tool Set, commonly used in Asia, contains all the tools to remove ear wax, clean ears and stimulate blood circulation of your body. 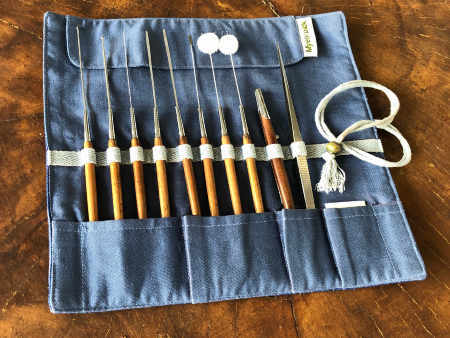 The tools are extremely relaxing and refreshing in the hand of a caring person. Out of sanitary reasons we recommend one set per person, hence the name Myearpick. Don't use them on pets or infants. Roll Case, fully stocked with tools, blades and tweezer. Roll Case versions “Ethnic Chinese” and “Thai”. Handmade in Cambodia, paying fair wages. Indigo hand dyed cotton strap and wrapping string. 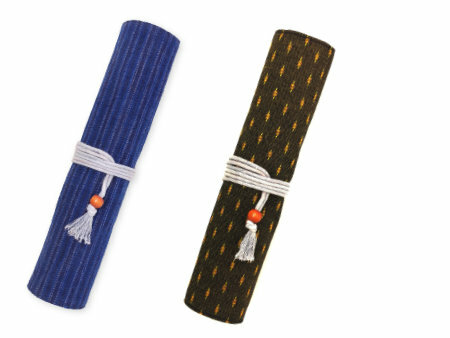 Each roll case is unique in color and weaving pattern. Materials: Linen and/or cotton, nylon lining, wood bead. 8 loops to secure all tools including razor blades. The perfect travel and home storage case for the ear cleaning tools. This is a one-of-a-kind roll case because the cover fabric is handwoven by people who believe in old traditions. I personally select them in China and South East Asia. Foldable cotton strap fasten the roll case tightly, prevent the tools from falling out. Easy to store and carry around.